The uniforms of the United States Army distinguish soldiers from other service members. U.S. Army uniform designs have historically been influenced by British and French military traditions, as well as contemporary U.S. civilian fashion trends. The two primary uniforms of the modern U.S. Army are the Army Combat Uniform, used in operational environments, and the Army Service Uniform, worn during formal and ceremonial occasions. The design of early army uniforms was influenced by both British and French traditions. One of the first Army-wide regulations, adopted in 1789, prescribed blue coats with colored facings to identify a unit's region of origin: New England units wore white facings, southern units wore blue facings, and units from Mid-Atlantic states wore red facings. Bandsmen wore red uniforms to make them more easily identifiable to commanders on the field of battle. Pantaloons were originally white, following British uniforms, but were changed to gray in 1821 and sky blue in 1832. Infantry wore tricorne hats, with different cover prescribed for cavalry and specialist troops depending on function. Beginning in the 1850s, U.S. military leadership began to place an increased emphasis on French army tactics and styles, influenced, in part, by the rise of Napoleon III. The most extreme examples showing the adoption of French military fashion was in the use of zouave uniforms by some U.S. Army infantry regiments, and the purchase of 10,000 chasseurs à pied uniforms to outfit the Excelsior Brigade. However, more subtle styling - including frock coats, kepi hats, and collar ornaments - also made their way into U.S. Army uniform design preferences. From the early 1900s through the end of the World War II, the U.S. Army went through several styles of khaki and olive drab uniforms and, by 1954, settled on the Army Green Uniform for service dress which was eventually pulled from service in 2010. An alternate semi-dress uniform authorized for officers during the summer months, the Army Khaki Cotton Uniform continued in use until 1985. Field dress during this period was either the Army Tropical Uniform, or the M1951 wool field uniform. These were followed in 1981 by the Battle Dress Uniform, which was pulled from use in favor of the Army Combat Uniform in the mid-2000s. In 1774, a blue Continental Army coat, with state facing colors, and white waistcoat and breeches or overalls was worn. The origin of "blue" as the primary uniform color is earlier during the Colonial period of the Continental Association or First Continental Congress which met in Philadelphia, PA and adjourned on October 26, 1774. George Washington was the appointed Presiding Officer. While Washington was in Philadelphia, one hundred neighbors in Fairfax County (VA), under the tutelage of George Mason, had organized themselves into a voluntary militia—probably the first in the colony—electing Washington their commander. Borrowing the colors of the English Whig party, the Fairfax Independent Company wore blue uniforms with buff facings and white stockings. Washington used Thomas Webb's A Military Treatise on the Appointments of the Army as a guide for outfitting this particular unit. Washington would soon accept the additional field command of another four independent companies: in Prince William, Fauquier, Richmond, and Spotsylvania Counties. By 1782, red facings only with branch of service white (infantry) or yellow (artillery) metal buttons were worn. 1810: French uniform coat with cut-in skirt fastened in front; sleeved roundabout jacket for fatigue and field service. 1813: Uniform coat devoid of buttonhole lace and facing colors. 1821: Congressional confirmation of army wear of national blue; practical gray wool pantaloons for the winter mud, a tradition of contrasting shades. 1829: Undress frock (full round skirt) coat in place of officer's civilian clothes. 1832: Branch of service cap insignia, gold or silver officer grade insignia on epaulettes and sky-blue trousers for all but staff and generals. 1835: Shoulder straps, used to hold fringed epaulettes, with undress, officer grade. 1851: French frock (full skirt) coat only uniform, trimmed in system of branch of service colors. 1872: Blouse for garrison and field, uniform coat for dress, with epaulettes for generals. 1881: Dark blue flannel overshirt often in place of blouse on field service. 1885: Sky-blue kersey trousers, aniline dye richer shade than original vegetable dye. 1895: Officer's undress sack coat, with black trim; branch of service insignia and national cypher "U.S." on collar, with national eagle on cap. 1902: Olive drab wool and khaki cotton service uniforms introduced; blue retained only for dress, full dress, mess dress, and special evening dress, trimmed with branch of service color. New patterns of blue full dress and dress uniforms adopted for both officers and enlisted men  Leather color changed from black to russet. The M1902 visored cap is adopted. 1907 and 1912: Minor changes prescribed for 1902 model blue dress and full dress uniforms. 1911: Wool felt M1911 Campaign Hat adopted. Hat cords were in Branch colors for enlisted men, a gold metallic thread and black cord braid for Subaltern and Field Officers, and woven of gold metallic thread for General Officers. 1917: Wearing of blue dress, full dress and mess dress uniforms suspended for the duration of the war. Warrant Officers were authorized a hat cord of silver metallic thread and black cord braid for wear with the M1911 Campaign Hat. The side-folding cloth Overseas Cap was unofficially adopted by AEF personnel in a variety of styles influenced by similar Allied patterns. 1921: The M1911 Campaign Hat was redesigned. 1928: Return of pre-war blue dress uniforms with new visor cap, optional at expense of wearer. 1938: Officer's blue roll-collar coat adopted, with branch of service-color trim and dress belt (from full dress coat). 1939: The side-folding Overseas Cap is universally adopted as the Garrison Cap. 1940: No blue uniform required during emergency (end of saber). 1941: The M1911 Campaign Hat is declared Limited Standard. 1947: President Harry S. Truman note on lack of dress uniform and return of pre-war pattern; evening dress uniform cuff with single gold lace and insignia of grade. 1953: Post-war officer and EM pattern with patch pockets; no traditional branch of service color trim on EM uniform and officers' trousers stripes. 1954: Official adoption of the Army green Class "A" uniform. 1956: Distinctive uniform for bands and honor guards. Leather color changed from russet to black. 1957: Women's army blue uniform same cut as 1951 Taupe-121 uniform. 1959: Army blue uniforms for year-round wear. 1962: Women's army blue same as army green uniform, with new service hat. 1963: Mandatory possession of officer's army blue uniform. 1972: Officers' mess jacket cuff ornamentation simplified to resemble that of 1947 evening dress (grade insignia replaced branch insignia; single strand of gold lace replaced multiple ones which previously showed grade). 1993: Green changed to a darker shade and pleats added to shirt pockets. 2008: the new blue army service uniform (ASU) is introduced for optional wear by soldiers. 2010: blue ASU issued to all soldiers, beginning in autumn. 2015: Army green Class "A" uniform officially retired; blue ASU worn army-wide after October 1. 2020: New "Army Greens" service uniform will be issued to soldiers reporting to their first units. 2028: All soldiers will be required to have the new "Army Greens" uniform for wear. In the early days of the U.S. Army, the uniform worn in combat was essentially the same as that worn for everyday duties. This was the common practice with most armies of the time. This changed in modern times, as field uniforms were developed which were more suited for battle. During the Civil War era, army uniforms were relatively simple. Typically, the same uniform served as a garrison uniform and as a combat uniform. Combat soldiers in the U.S. Civil War wore a standard dark blue coat, just like personnel in garrisons or in army offices and headquarters. In the first half of the war, many states supplied their regiments with uniforms, resulting in distinctive jackets and buttons. Rank was indicated by a shoulder strap for officers, and chevrons on the sleeves for non-commissioned officers. Branch or specialty could be indicated by the color of the enlisted badge of rank, or the background color for officers' shoulder straps. Uniform standards were relaxed during the war years, especially on campaign, and men often wore a variety of hats in the field. The 1899 Army Uniform Regulations provided for a cotton khaki uniform for field service, drawing on the experience of the Spanish–U.S. War when both blue and drab clothing had been worn. From 1902 to 1917, the army had two uniforms: a service uniform of wool olive drab Melton cloth for use by soldiers in the field, and a blue dress uniform used for ceremonies and off-post wear by enlisted men. Lieutenant General Edmund B. Gregory, the Quartermaster General, looking back in 1946, pointed out that World War I uniforms had subtly changed from a comfortable loose-fitting four pocket field garment to a tight-fitting version suitable only for garrison wear. At the outbreak of World War II, the army had to develop new loose-fitting patterns which the men could live in, as well as muster on the parade ground. Gregory noted that this gradual change to a tight-fitting uniform in peacetime has been characteristic of the history of uniforms in all armies. Around 1940, soldiers began to use special uniforms designed for combat or field operations, with numerous special equipment and packs. The M-1941 Field Jacket was one of the first clothing items which was approved specifically for use in the field, and which was not meant to be part of a standard service uniform. After this, service uniforms started to become more elaborate, as they were not needed to be useful in combat, and could take on a unique appearance, with new features and embellishments. Units began to display their own special patches, and badges were added for various specialties. Among the earliest unit patches was for the 81st Infantry Division. This unit trained at Fort Jackson, South Carolina. They created patches showing a wildcat, so that they could identify each other quickly in combat. Some officers questioned this, but General John Pershing decided it was a good idea, so the army started to implement it for all units. From 1954 to 2010, the main service uniform was the green service uniform or "class A". The Army reviewed various ideas in the late 1940s in order to create a distinctive uniform. Many civilian workers were mistaken for Army personnel because of massive use of army surplus clothing after World War II. 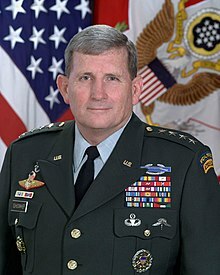 US Army green service uniform for officers, as worn by former Army Chief of Staff General Peter Schoomaker. Army commissions reviewed various factors of design, durability and appearance. Blue was considered because of its acceptance in men's clothing, but it would then have been too difficult to distinguish it from Air Force and Navy service uniforms and the Marine Corps and Navy dress uniforms. Several colors were reviewed, and finally green (shade 44) was designated the basic color for new dress uniforms. The green uniform has been worn with minor variations since its official adoption in 1954. The green color was adopted in order to provide a color which was more military, and distinct from various uniforms of civilian service workers. It features a jacket with four buttons. Enlisted soldiers wear insignia denoting their branch of service on their collars. Officers wear two sets of insignia consisting of the letters "U.S." on their collars and their branch on their lapels. Proficiency badges, such as the marksman's badge, are worn on the upper left pocket flap. Above this are the ribbons for medals and commendations which have been earned for various actions, duties, and training. Above the ribbons are qualification badges, such as the parachutist badges and combat action badge. A nametag is worn on the upper right pocket flap. Unit awards and foreign awards are worn above the right pocket, with a regimental insignia above both. Special duty badges, such as the recruiter badge, are worn on the upper two pockets of the jacket; the side on which they are worn varies by badge. US Army green service uniforms for enlisted personnel. Differing shoulder patches denote various units. On each shoulder of the uniform are unit patches. The left side will have the patch of the soldier's current unit assignment. The right shoulder may have the patch of a unit to which the soldier has previously been assigned while deployed to a combat zone; soldiers with multiple previous combat assignments may choose which patch to wear. Tabs indicating ranger, special forces, or sapper qualification, if applicable, are worn above the unit patch on the left shoulder. A similar "airborne" tab is worn immediately above the unit patch if the command is designated as airborne, irrespective of whether the individual soldier is qualified as a paratrooper. As the shoulder sleeve insignia generally indicates merely the general-officer command to which the soldier is assigned, the soldier's immediate battalion or intermediate-level command may be indicated by distinctive unit insignia of metal and enamel, on the soldier's epaulets. Issuance of the Army green service uniform was halted in 2010, and the uniform was phased out in 2015, and was completely replaced by the blue ASU. The green service uniform was discontinued in 2015 after 61 years of approved wear, the vast majority of that stretch as the service uniform that defined the Army at the time. On Veterans Day 2018, the Army announced that a new version of the Army Greens, based on the "pinks and greens" uniform worn in World War II, would be brought back as the everyday service uniform starting in 2020. One of the Army's Dress Uniforms, the Army White Uniform, was the army's equivalent to the dress white uniform worn by officers in the U.S. Navy. However, unlike the navy, which mandates the owning and wearing of the white uniform throughout the summer months (year round in tropical locations) by all ranks (E-1 to O-10), the Army white uniform was an optional uniform, and was only required to be purchased by officers and sergeants major assigned to posts in the tropics and the southern United States. The Army white service uniform was phased out in 2014. Introduced in 1902 as a summer undress uniform, its wearing, along with the dress and undress blue, was suspended during World War I and was reintroduced in its present form, along with the modern-day dress blue uniform, in 1938. In its original (1902) form the white uniform included a standing collar and white flat braid trimming the coat edges. The 1938 model substituted a white coat without braid and with an open-fronted peak lapel worn with a white shirt and black tie. With the impending hostilities of World War II, production of both the blue and white dress uniforms were suspended, but the Army white uniform itself served as a model for the Army winter service uniform, which was introduced in 1942 (replacing a belted version designed around the Sam Browne Belt) and discontinued in 1968. The shirt and trousers "class B" uniform was replaced with the Army green class "B" uniform in 1985. The post-war belt-less Army Blue Uniform, and the Army green uniform, had earlier replaced the World War II "Pinks & Greens" and pattern 1942 service coat or "Eisenhower jacket" uniforms in 1956. Like the Army green uniform, the Army white uniform featured a main jacket with four buttons, worn with matching white trousers and service cap, but unlike the Army green uniform, no unit patches, specialty tabs, or the black beret were worn. Officers wore their silver or gold-colored rank insignia pinned onto the shoulder epaulets, while enlisted personnel wore gold-on-white rank insignia and service stripes on both sleeves as that on the Army Blue Uniform. A white dress shirt and either a black bow tie or four-in-hand necktie, for formal and semi-formal functions, were worn. The Army Combat Uniform (ACU) is the utility uniform worn in garrison and in combat zones by the U.S. Army. The uniform originally featured a digital camouflage pattern, known as the Universal Camouflage Pattern (UCP), which was designed for use in woodland, desert, and urban environments. The ACU jacket uses hook-and-loop-backed attachments to secure items such as name tapes, rank insignia, and shoulder patches and tabs, as well as recognition devices such as the U.S. flag patch and the infrared (IR) tab. Two U.S. flag insignia are authorized for wear with the ACU: full-color and subdued IR. The U.S. flag insignia is worn on the right shoulder pocket flap of the ACU coat. Unit patches are worn on the left shoulder, while combat patches are worn on the right. In July 2011, coinciding with the Army's Birthday, it was announced that effective immediately, the Army Patrol Cap, or "PC", would replace the black beret for wear with the ACU, and that name tapes, rank, and skill badges can optionally be sewn on. In the field, the jacket may be replaced by the flame resistant Army Combat Shirt when worn directly under a tactical vest. Most soldiers operating in Afghanistan are issued a "MultiCam" pattern better suited to that country's terrain. The Army has announced the replacement of the Universal Camouflage Pattern for the ACU in favor of the Operational Camouflage Pattern (OCP), which is similar to MultiCam. Current plans call for a full transition to the OCP by the autumn of 2019. The standard garrison service uniform is known as the "Army Service Uniform". It replaced the "Army Greens," or "Class A" uniforms, in October 2015, which had been worn by all officers and enlisted personnel since its introduction in 1956, when it replaced earlier olive drab (OD) and khaki (called Tropical Worsted or TW) uniforms worn between the 1890s and 1985. The "Army Blue" uniform, dating back to the "Virginia Blues" of George Washington's first command, in the Colonial Virginia Militia, had previously served as the Army's formal dress uniform, was phased in to replace the Army Green and the Army White uniforms in October 2009. This uniform functions as both a garrison uniform (when worn with a white shirt and necktie) and a dress uniform (when worn with a white shirt and a bow tie for "after six" or "black tie" events). The blue uniform has been a mandatory wear item since fourth quarter, FY2014. 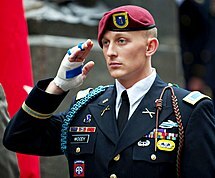 The beret, adopted Army-wide in 2001, continues to be worn with the Army Service Uniform for non-ceremonial functions. The current service uniform will be replaced starting in 2020 by a new version of the "Army Greens", based on the "pinks and greens" uniform worn in World War II. The current Army Blues Uniform will return to being a formal dress uniform. The new service uniform will include khaki pants and brown leather oxfords for both men and women, with women having the option to wear a pencil skirt and pumps instead. There will be a leather bomber jacket as an outerwear option. Mess dress is the military term for the formal evening dress worn in the mess or at other formal occasions. This is generally worn as the military equivalent of white tie or black tie. The Army blue mess uniform comprises the Army blue mess jacket, dark- or light-blue high-waisted trousers, white semiformal dress shirt with a turndown collar, black bow tie, and black cummerbund. The Army blue evening mess uniform comprises the Army blue mess jacket, dark- or light-blue high-waisted trousers, white formal dress shirt with a wing collar, white vest, and white bow tie. The blue trousers are cut along the lines of civilian dress trousers, with a high waist and without pleats, cuffs, or hip pockets. The trouser leg ornamentation consists of an ornamental braid worn on the outside seam of the trouser leg, from the bottom of the waistband to the bottom of the trouser leg. General officers wear pants of the same color as the jacket, with two ½–inch, gold-colored braids, spaced ½ inch apart. Current stated uniform regulation for mess dress is that all other officers and enlisted personnel wear lighter blue trousers with one 1 ½ inch, gold-colored braid. However, regulations for the Army Service Uniform dictate that the trousers of junior enlisted personnel, specialist and below, be without ornamentation. There has been no official Army guidance as to whether this should also apply to the mess and evening mess uniforms. The Army white mess uniform comprises the Army white jacket, black high-waisted trousers, white semiformal dress shirt with a turndown collar, black bow tie, and black cummerbund. The Army white evening mess uniform comprises the Army white jacket, black high-waisted trousers, white formal dress shirt with a wing collar, white vest, and white bow tie. The trousers are the same for all ranks. The Army Physical Fitness Uniform (APFU), manufactured by UNICOR and adopted in 2013, is modular, with individual pieces that can be combined or eliminated depending on physical training conditions. All parts of the uniform are styled in black and gold and include track jacket, short-sleeve and long-sleeve T-shirts, track pants, and stretchable running trunks. The uniform was released on October 1, 2014. No standard shoe style is specified to be worn; soldiers are expected simply to purchase commercial running shoes. Shoes with profane or vulgar logos, however, as well as "toe shoes" (such as the Vibram FiveFingers running shoe), are prohibited. U.S. Army uniform regulations define a class of "special ceremonial units" (SCU). SCUs, which include guards units and bands, are authorized to wear distinctive uniforms – in lieu of the Army Service Uniform – for public duties, including state arrivals, official funerals, change-of-command and retirement ceremonies, and the presidential inaugural parade. The U.S. Army has 34 active-duty bands and more than 50 reserve bands. Most of these units wear the Army Service Uniform for public duties, however, certain units – primarily located in the National Capital Region – have unit-specific uniforms that are used for special occasions. Unlike the Army Service Uniform, these specialized uniforms are, for budgetary reasons, generally issued to units – instead of individuals – and returned to the unit following the soldier's departure. The U.S. Army Band "Pershing's Own", the U.S. Army Field Band, and the U.S. Army Herald Trumpets wear a parade uniform designed by the U.S. Army Institute of Heraldry and introduced in 1969 for the inauguration of Richard Nixon. The uniform blouse has a choker-style collar, instead of the open collar used on the Army Service Uniform, and eight buttons, representing the eight notes of the musical scale. Decorative gold braid adorns the cuffs and standard army cover is replaced by a crimson peaked hat, while Drum-Majors wear a bearskin helmet. A summer white blouse is also available. In the 1950s "Pershing's Own" briefly wore a yellow and black uniform known as "the Lion Tamer" due to its resemblance to a circus costume. Before World War II, the band's uniform was a grey variation of the standard dress blue uniform. The 3rd Infantry Regiment Fife and Drum Corps wear red, open-front regimental coats, white coveralls, and black tri-corner hats. The U.S. Military Academy Band – a full-time Army Special Band assigned to the U.S. Military Academy at West Point - wears distinctive, high-collared navy jackets with white accessories and dark shakos. From 1875 to 1890 the band wore pickelhaube instead of shakos. The Commander-in-Chief's Guard, part of the 3rd Infantry Regiment, uses a special dress uniform that is evocative of the uniform worn by Gen. George Washington's life guard. It consists of open-front, blue regimental coats, white coveralls, and black tricorner hats. The First Troop Philadelphia City Cavalry (a Pennsylvania National Guard unit) has a special full-dress uniform known for its distinctive helmet with extravagant bearskin roach. The 1st Cavalry Division's Horse Detachment was given status as a Special Ceremonial Unit in 1972. Their parade uniform consists of a navy "fireman's shirt", worn with Columbia blue trousers with yellow piping. Accoutrements include a divisional kerchief worn around the neck and yellow suspenders. Cover is the Cavalry Stetson. Other non-band SCU units with distinctive uniforms include 54th Massachusetts Volunteer Infantry. Cadets enrolled at the United States Military Academy at West Point wear standard Army uniforms, including the Army Combat Uniform and the Army Physical Fitness Uniform, but also use several unique uniforms for drills and daily wear in lieu of the Army Service Uniform. Since 1816, West Point cadet uniforms have been styled in cadet grey which continues to be the primary color used in academy dress. Spring parade dress consists of cadet grey swallow-tail coats with 21-gold buttons, a standing collar, white trousers, and black shakos (known as a "tarbucket hat" in U.S. Army nomenclature). Winter parade dress is similar to spring parade dress, though trousers are colored cadet gray instead of white. This same uniform is worn without the black shakos hat and with the gray or white peaked service cap depending on the season when not parading but still required for formal events. For evening formal events, no headgear is worn. Summer dress ("India Whites") consist of a white overblouse with a standing collar, white trousers and white peaked service caps. Service dress (“white over gray”) consists of grey trousers, short sleeve white shirts with shoulder boards, and white peaked caps. "Dress Gray" uniforms consist of gray blouses with a standing collar and trimmed with a one-inch black mohair braid band, gray trousers and gray peaked caps. In cold weather, a gray Long Overcoat is worn over the uniform. The daily service uniform ("As for Class") consists of gray trousers, charcoal gray shirts in long sleeve and short sleeve variants and gray peaked caps. Cadets at senior military colleges are authorized, under Army Regulation 670-1, to wear uniforms developed by their institutions. Regular U.S. Army personnel assigned to those units as instructors may also wear institutionally developed uniforms in lieu of standard army dress. Most corps of cadets at senior military colleges wear uniforms loosely patterned on that of the U.S. Military Academy at West Point. 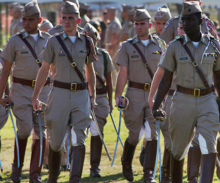 One exception is Texas A&M University which has several styles of unique cadet dress uniforms, the most formal variation being the "Midnight" uniform, consisting of olive drab shirt, "pink" trousers, khaki tie, black low quarter shoes (or brown riding boots for senior cadets), Sam Browne belt, and either peaked hat, Stetson, or side cap, depending on circumstance. The corps' special ceremonial unit, the Ross Volunteers, wear an all-white parade uniform with peaked hat, and the Fish Drill Team, the corps' all-freshman rifle drill squad, wears the "Midnight" uniform with black "paratrooper" boots, white belts, and black polished combat helmet with chromed brass. In general, the Texas A&M Corps' uniforms are virtually identical to those worn by Army personnel during World War II. Reserve Officer Training Corps (ROTC) and Junior ROTC cadets wear the Army service uniform, the Army Combat Uniform and the Physical Training Uniform. The Green Service uniform in its class A and B forms has since been phased out entirely by the class A and B ASU, which cadets now wear for all formal occasions. A U.S. Army colonel wearing his "Cavalry Stetson"
Soldiers assigned to the cavalry units may, during certain divisional functions, replace standard army soft cover (the black beret, the blue peaked hat, or the camouflage patrol cap) with the “Cav Stetson,” a black Stetson with gold braid and cavalry branch insignia. U.S. Army Drill Sergeants are authorized to wear a campaign hat while in the Army Combat Uniform. First adopted in 1911, the campaign hat was abandoned for drill instructor use during World War II, but readopted in 1964. Army campaign hats are olive green with the Great Seal of the United States centered on the front of the hat on a gold disc. Several berets in alternate colors to the Army standard black beret are also used. Personnel assigned to units trained and equipped for parachute infiltration, known as airborne forces—such as the 82nd Airborne Division—are authorized to wear the maroon beret while paratroopers assigned to the 75th Ranger Regiment wear tan berets. Soldiers who graduate from the Special Forces Qualification Course are authorized to wear the green beret. The Army's newest units, the Security Force Assistance Brigades (SFABs), are authorized to wear a dark-brown beret. The U.S. Army has also authorized the wear of some distinctive black or red baseball style military headgear that are worn as special skill instructors (a.k.a. "Black Hats") or Parachute Riggers, respectively. The U.S. Army tartan, designed by Strathmore Woollen Company, is black, khaki, blue, gold, and two shades of green. The United States Army Civil Affairs and Psychological Operations Command has a separate tartan of green, black, purple and white. However, there are currently no U.S. Army units that use Highland dress and the wear of kilts with U.S. Army uniforms is prohibited by Army regulations. Among armies in the five UKUSA Agreement nations, only the United States and New Zealand do not actively field Scottish units, though both nations have done so in the past. Nonetheless, in keeping with U.S. Army uniform regulations that permit cadet commands at the U.S. Military Academy and the senior military colleges to introduce institution-specific uniforms, members of the bagpipe bands at West Point (the United States Military Academy), The Citadel (The Military College of South Carolina), Norwich University (The Military College of Vermont), and the Virginia Military Institute wear a Highland uniform while performing as part of their respective ensembles. These uniforms are patterned on collegiate tartans instead of the U.S. Army tartan. The Oregon State Defense Force (OSDF) also fields a pipe band that wears a modified Highland uniform, including kilt and sporran, authorized by the Oregon Military Department. ^ David Cole. Survey of U.S. Army Uniforms, Weapons, and Accoutrements (PDF) (Report). U.S. Army. p. 1. ^ Emerson, William (1996). Encyclopedia of United States Army Insignia and Uniforms. Norman, Oklahoma: University of Oklahoma Press. ISBN 0806126221. ^ American Civil War: The Definitive Encyclopedia and Document Collection. ABC-CLIO. 2013. ^ "History of U.S. Army Uniforms". military.com. Retrieved 1 January 2014. ^ Chernow, Ron (5 October 2010). Washington: A Life. Penguin. ISBN 978-1-59420-266-7. Retrieved 30 October 2012. ^ Randy Steffen. The Horse Soldier, Vol. 3, page 95. ISBN 0-8061-2394-X. ^ Randy Steffen. The Horse Soldier, Vol. 4, page 66. UE443.S83. ^ a b c d "U.S. Army to roll out new Army Greens uniform". www.army.mil. U.S. Army. November 11, 2018. Retrieved November 12, 2018. ^ Randy Steffen, page 69 Volume III, "The Horse Soldier 1776-1943"
^ a b c The Army Dressed Up Archived 2008-04-17 at the Wayback Machine, 1952, Dr. Stephen J. Kennedy, The Quartermaster Review, January/February 1952, Army Clothing History page, Army Quartermaster Foundation, Inc. Website, accessed 4-9-08. ^ Pride important for US soldiers Archived December 12, 2007, at the Wayback Machine, by Lee Berry, Univ. of Mississippi. ^ "Prestige of the Soldier" Archived 2008-04-17 at the Wayback Machine, Major A. M. Kamp, Jr. The Quartermaster Review, May/June 1954, Quartermaster foundation, accessed 4-9-08. ^ Lopez, C. (February 20, 2010). "Soldiers to get new cammo pattern for wear in Afghanistan". US Army. US Army. Retrieved February 22, 2010. ^ Garland, Chad (November 11, 2018). "What's old is new: Army rolls out 'pinks and greens' service uniform". Stars and Stripes. Retrieved November 12, 2018. ^ Myers, Meghann (November 11, 2018). "It's official: Army approves 'pinks and greens' uniform on Veterans Day". Army Times. Sightline Media Group. Retrieved November 12, 2018. ^ Bacon, Lance M. (August 29, 2011). "'Toe shoes' get the boot, Army-wide". Army Times. Retrieved 2012-07-16. ^ "The U.S. Army Band Uniform". U.S. Army Band. Retrieved 31 December 2013. ^ Seymour, Joseph (2008). First Troop Philadelphia City Cavalry. Arcadia Publishing. ISBN 0738557676. 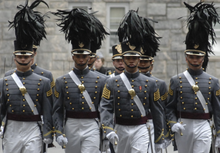 ^ "West Point Cadet Uniforms". usma.edu. U.S. Army. Retrieved 31 December 2013. ^ "The Corps Uniform". tamu.edu. Texas A&M University. Retrieved 31 December 2013. ^ Philip Battaglia (15 August 2010). Memorandum of Instruction (MOI) Concerning the Wear and Appearance of the CAV Cover and Spurs (Report). Department of the Army. Cole, David (2007). Survey of United States Army Uniforms, Weapons and Accoutrements (PDF). United States Army Center of Military History. Archived from the original (PDF) on 29 December 2009. Wikimedia Commons has media related to Uniforms of the United States Army. This page was last edited on 21 April 2019, at 06:05 (UTC).